Starting a business can be very daunting! Starting a creative business is no exception. In some ways it feels more daunting because of the personal aspect of it. We are selling something we have personally created or dreamed up and there can be a lot of emotions tied to that! I’m a big believer in starting before you feel ready. That goes for all things. I would much rather figure things out as I go along than wait until I have everything figured out. Action is always better than over thinking. If we all waited until we felt ready we would never start! Most successful creative businesses are figuring things out as they go. When I started my first creative business I didn’t accept a single dollar until I was prepared to disclose that dollar as income. In most cases, it’s not difficult to get to that step. You may have already collected money and now don’t know what to do. 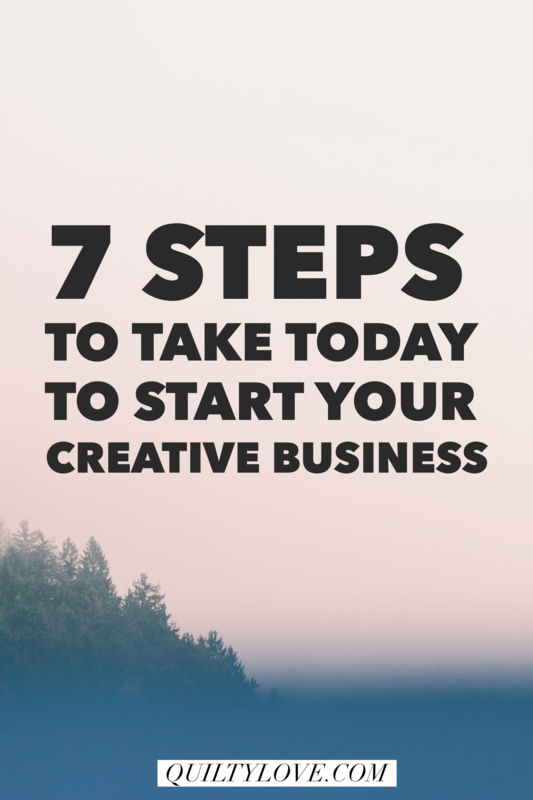 I’ll break down 7 steps to take right now to get your creative business going. If you are a maker or a designer and want to take your services online, these steps should help. Most of us will already have this step done because it’s the easiest! Social media is where most of us naturally start building our creative thing. Sometimes we start without even realizing it’s happening. Social media is usually where we realize we have a potential business on our hands. Decide what social media channels you will use. You don’t need to do them all! In fact, for most of us focusing on one or two will be better for our business. Don’t feel guilty because you only hang out on Instagram and have neglected Facebook (or vice versa). Keeping your profile consistent across all social media is so important. You start to develop brand recognition a lot faster when your name and profile photo are the same across your platforms. Should you use your actual name or your business name on your social media? I think that depends on your business. There are benefits to doing both. I chose my actual name on Instagram for my quilting business and I think it’s helped build connection with my audience. But I will say, there might be a little bit of a disconnect with my actual brand sometimes which goes by a different name. I really believe you need a website for business growth. Instagram is a really good place to build a business but you will eventually run into limitations. Building my Quilty Love blog quietly years ago has really paid off. It’s led to a lot of opportunities and growth that would not have come without it. A lot of creatives get paralyzed by the choices when it comes to starting a blog or website. I’m going to break it down real simple here. Choose a platform. Pick WordPress or SquareSpace. There you go! I’ve narrowed it down to two options for you already. There are a million more options but these two options are the most popular choices and will do everything you need them to do as a creative. WordPress: With WordPress you actually need to choose a host first. It will be easiest if you choose your host and then purchase a domain and set up WordPress through your host. WordPress recommends 3 different hosts. One of the three is Dreamhost who I’ve been using to host my three websites for past 7 years with zero issues. Once you choose your host, sign up through them and find their One Click Install of WordPress. They try to make this step as easy as possible! I’ve set up all of my websites on my own this way. SquareSpace: SquareSpace is kind of a one stop shop of hosting/ domain and templates all in one. It’s a great option! It does have some limitations and is a bit pricey. I looked into this option and did their free trial but as a WordPress user I couldn’t justify the switch. Find out more about WordPress vs SquareSpace here. Make it look Pretty. This part can be kind of fun! Your installed website will look pretty generic. The easiest way to fix this is to use a theme to pretty it up. WordPress and SquareSpace both have great free options for starting out. I don’t recommend random inexpensive third party themes. They will be much harder to customize on your own. I personally use Genesis and love it. It’s super easy to customize myself. No coding required. I maintain my own websites because I have good themes that make that easy to do. Start publishing posts. Yes, it really can be that easy! Set it up and start writing. Like I said before I started my quilting blog quietly. I didn’t even tell anyone about it. I set it up and starting posting. Once I had a few posts up I started linking to it. I started pinning images from it. I started sending people there when I published something new. You don’t have to make a huge announcement and “launch it”. Doing it quietly worked well with my personality. Once it felt more established and not so NEW I had more confidence to start talking about it. Take this step today in setting up your website even if you don’t tell anyone about it. Next you will need an e-mail address. Just like websites there are a ton of options. You can get a free e-mail through yahoo or google but they will contain @yahoo instead of @yourbusiness name. Google. Chances are you already have an account set up with google’s G Suite. You can easily purchase an e-mail address through google for $5/ month. That’s what I use for a custom e-mail address. Use your host site. Most hosting sites offer e-mail addresses. In some cases they are included in your hosting. Sign into your host site and set up your e-mail address there. Now that you have a website to blog and share information about yourself and your business, it’s time to set up your selling site! If you are a maker, this is where you will sell your products. If you are a designer, you might sell your services or your digital products here. Shopify. My personal choice is Shopify. I switched to Shopify about 9 months ago and don’t regret it for a second. But here’s the thing, Shopify starts out at around $30/month. When you are starting at ZERO that’s hard to commit to. If I could have told my newbie self that it was all going to be just fine and start with Shopify I would have. Etsy. That’s where Etsy comes in. Etsy is super easy to get up and running and there are virtually no upfront costs. Once you have committed to this creative venture then it’s a good idea to switch to your own shop like Shopify or Woo Commerce. But here’s the thing about Etsy for beginners. It shows your sales. Starting out that is not always a good thing! I didn’t like that at all. Social proof is a powerful thing and the low numbers don’t work in your favor here. That’s why a lot of creatives are tempted by the free options like Big Cartel. It’s free for a certain number of products and then you start paying. So it’s a good shop for FREE! No one can see if you sold something 3 times or 300 times. Except…. you outgrow the free option. Quickly. And now it costs as much as Shopify without all the features. That’s the route I took. The free Big Cartel option drew me in and suddenly I’m upgrading, and then upgrading again and now Big Cartel is costing more than the much more robust Shopify. But all of your pins link to the Big Cartel shop. All of your blog posts link to the Big Cartel shop. I used to recommend Big Cartel but after going through this hurdle I no longer do. Instead I recommend Etsy and then pick Shopify or Woo Commerce. Woo Commerce. I personally don’t use or have experience with Woo Commerce. It’s a WordPress option. I did a little research about it and discuss that more in this post. This is the step that usually freezes everyone in their tracks. It’s surprisingly easy to become a “real business”. And basically, if you made money in any way, shape or form the IRS already recognizes you as a business. Even a hobby business needs to be disclosed. This is the part where checking in with your accountant or even a business lawyer is a good idea. I am neither one of those things so I can’t offer you specific advice. Most makers and designers will start out as a sole proprietor using their own social security number. So what does this mean? Let’s say you made money through an Etsy shop you opened this year. Yay! Now you just need to tell your accountant about it. Your accountant can help you decide what expenses to deduct and all of that. They will probably have some good recommendations for you going forward. Tax ID: Getting a tax ID number is free and easily done online through the IRS. I obtained my own Tax ID number easily online. The IRS has a handy checklist here for Starting a business. Sales tax number: Again, this is the part where checking in with your accountant or even a business lawyer is a good idea. I am neither one of those things so I can’t offer you specific advice. Sales tax is very state specific but most states will require a sales tax number to sell physical products to people within your state. It’s easy to obtain a sales tax number through your state’s website. Most of the time sales tax is only charged when an item is sold within your own state. Most selling sites allow you to easily set this up in the settings section. Sales tax is money you collect for your state. Sales tax is not “money you pay”. You are simply collecting it for your state and passing it on to them. The sooner you have a system in place to separate this money you collect out of your main account, the better! Otherwise you begin to feel like you are “paying sales tax”. Business License: This will also be very state specific. In some cases, very city specific. The SBA is a great place to start when looking into a business license. Most makers will probably find they don’t need a business license. Do yourself a favor and open a checking account for your business! Separating your business accounts from your personal accounts will make tax time so much easier. This is an easy step and one you will be so glad you did! Once it’s set up, run all deposits through it and all expenses through it. I talk about more accounts to open in this article. There is no better way to feel legit and motivated than to register your business! If your business name is anything other than your actual name, this step is required. Most makers will start out using their own name and be recognized as a sole proprietor. But switching over to an LLC is an easy to step to take. It’s not difficult to register your business as an LLC and doing so will offer some legal protection for you and your family. The SBA has some good info on it here. I had a lawyer form my first LLC for about $100. I recently just updated, renamed and restructured this info myself through my states website. A little digging on your states website will probably be enough to tackle this on your own. So there you have it! Seven concrete steps to take to start a creative business and make this thing happen! I’ll be rooting for you! Previous Post: « Calling all pattern testers! FABULOUS article Emily!!! I have been contemplating this for several months and you have answered (very thoroughly) my questions about the web aspect!1 Thanks so much. Thank you so much Emily! 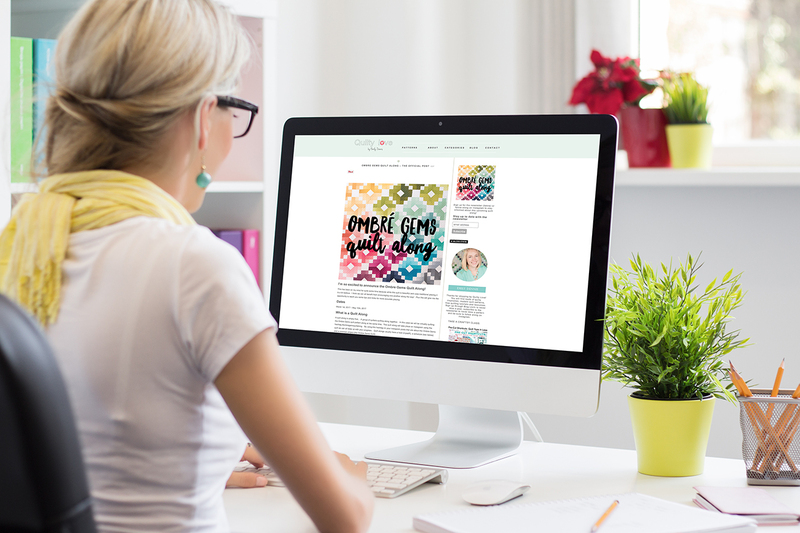 I’ve just started with the blogging thing in partnership with my local quilt shop, and this has given us so much to think about! This is amazing. I sold patterns years ago and really want to get back into it now that things are so digital. All of this information is so helpful! So great of you to Share! Thank you Jenny! Best of luck to you! Emily! Thank you for this very thorough punch list – it’s exactly the nudge I needed to finally get started. I love that you gave me permission to start my website/blog ‘quietly’ … that’s way more comfortable for me. Thanks again for sharing and I look forward to more Create your day job posts!